Several studies have previously reported propolis, or its constituents, to inhibit tumour angiogenesis1. The anti-angiogenic activity of two Indonesian stingless bee propolis extracts from Sulawesi Island on vascular cells were assessed. Sample D01 was obtained from the outer side of bee hives, while D02 was from the inner side of the same hives. Preliminary results of cell viability and multi-channel wound healing assays on HUVECs and placenta-derived pericytes demonstrated that D01 elicited a strong cytotoxic effect and a considerable anti-migratory activity on the vascular cells. Although D02 demonstrated a much weaker cytotoxic effect on the cell lines compared to D01, it elicited a substantial protective effect on the pericytes against CoCl2-induced dropout in an experiment to mimic a micro-environment commonly associated with angiogenesis and tumour growth2. These results demonstrate modulatory effects of these propolis samples in vascular cells, which requires further investigation. The extracts were profiled by using liquid chromatography coupled to high resolution mass spectrometry. The most abundant compounds in Indonesian sample D01 from LC-MS analysis seem to be unusual since they do not immediately fall into a clear class such as flavonoids or terpenoids. Two of the most abundant compounds have elemental compositions matching actinopyrones which are antibiotic compounds isolated from Streptomyces pactum3. Identification on the basis of elemental composition is not definitive but compounds in D01 are possibly due to unusually modified terpenoids. Sample D02 has abundant compounds which include four related diterpenes with differing degrees of oxygenation and some sesquiterpenes. However, again the profile is unusual. 1. Daleprane JB and Abdalla DS (2013) Emerging roles of propolis: antioxidant, cardioprotective, and antiangiogenic actions. Evid Based Complement Alternat Med, 2013:175135. 2. Raza A, Franklin MJ, and Dudek AZ (2010) Pericytes and vessel maturation during tumor angiogenesis and metastasis. Am J Hematol 85(8):593-8. ISNAD IQBAL, Muhammad , FAN, Tai-ping , WATSON, David , ALENEZI, Sameah , SAHLAN, Muhamad . "Preliminary Studies: The Potential Anti-Angiogenic Activities of Two Sulavesi Island (Indonesia) Propolis and Their Chemical Characterization". 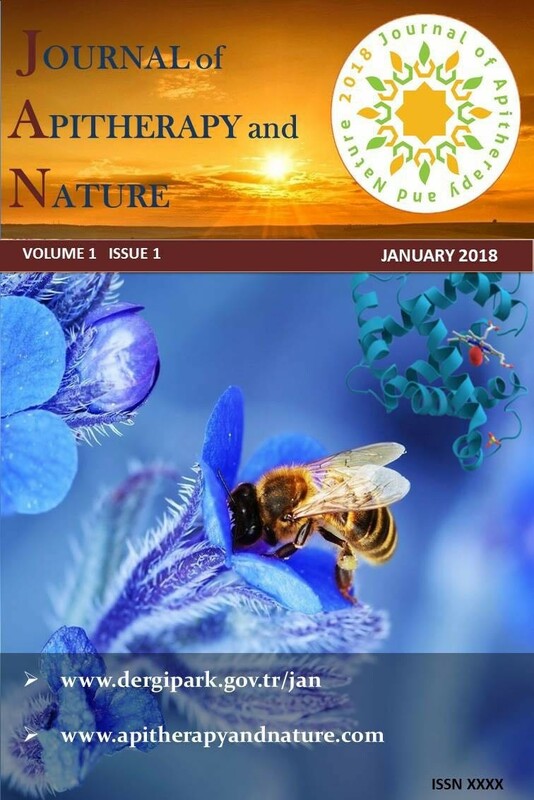 Journal of Apitherapy and Nature 1 / 3 (December 2018): 49-49.